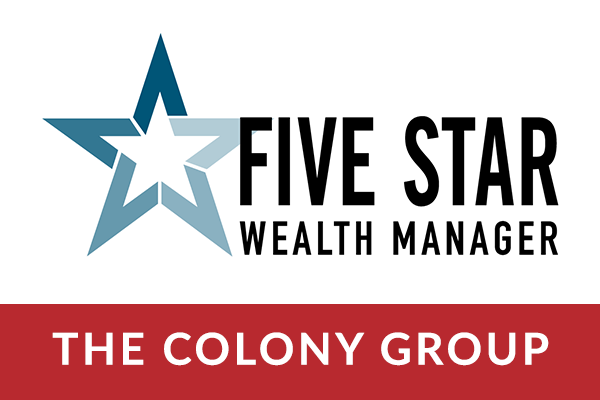 The Colony Group is proud to announce that 22 of our Wealth Advisors were recognized with the 2018 Five Star Wealth Manager Award in the February edition of Boston Magazine. As Five Star Wealth Managers, our advisors were selected for providing quality services to their clients, among other criteria. The Five Star Professional team’s research and evaluation process included factors like client retention, education and professional designations, and client satisfaction. Congratulations to The Colony Group’s 22 Five Star Wealth Manager Award recipients for being recognized for their dedication to their clients and their profession. Go to www.fivestarprofessional.com to see the award winners. The Colony Group is an independent, fee-only, financial advisory firm with approximately $7.5 billion in assets under management and approximately 140 employees as of January 1, 2018, with offices in Massachusetts, New York, Virginia, Florida, Colorado, and now Maryland. Founded in 1986, The Colony Group provides high-net-worth individuals and families, corporate executives, athletes, professionals, entrepreneurs, and institutions with deep expertise that goes beyond investment management and can encompass the full suite of wealth management services, including tax, estate, retirement, and philanthropic planning, asset allocation, and cash and risk management.